By now, we can all agree on this about Jameis Winston. He's no Tom Brady. Also, he is no Drew Brees, and he is no Aaron Rodgers, and he is no Matt Ryan. To further the point, he is no Philip Rivers, and he is no Russell Wilson, and is not Cam Newton. Frankly, there are a lot of quarterbacks who Winston is not yet, no matter which side of the debate you stand. Even Doug Williams caused conversations, because he didn't complete a high percentage of his passes. So here you have Winston, and a hung jury of his peers. Winston can tempt you with a big game or two, with a great throw or three. But then he'll get careless, and the game will get away from him. At times, he looks as if he could be the answer. At times, he is a collection of new questions. Only a month ago, I wrote a piece that talked about other quarterbacks, Hall of Fame quarterbacks who had struggled short of their 25th birthdays, quarterbacks who also led sloppy lives. That's true. Winston has played in 54 games, and he has 57 interceptions and 16 fumbles. So, then, I looked at other quarterbacks at age 24. Dan Fouts had a 5-20 record at Winston's age. Joe Namath had 70 interceptions. Peyton Manning had 58 interceptions. Joe Montana had two career wins. Steve Young had one. Len Dawson had none. At the risk of repeating myself, Drew Brees was 10-17 as a quarterback at Winston's age. Johnny Unitas was 10-9. Brett Favre was coming off of a 24-interception season. Troy Aikman was 7-19. Terry Bradshaw had 58 interceptions. John Elway had 52. Ken Stabler hadn't thrown an NFL pass yet. Y.A. Tittle was 1-6 at Winston's age. Bart Starr was 3-15-1. Fran Tarkenton had thrown 68 interceptions. All of that is true. It is easier for a quarterback to avoid interceptions these days because of rule changes, but the point is that those guys needed some time, too. For the purposes of this article, I compared the 13 starting quarterbacks in the NFL who are age 25 and younger (Winston turns 25 in less than a month). Frankly, he's struggling. Now, you can blame his teammates if you want -- the defense is lousy and there is no running game and the Bucs' coaches think far more of their offensive linemen than the rest of us do. You can blame his coaches. You can blame the balls that his receivers drop. But stat-to-stat, Winston isn't measuring up to the rest of the kid quarterbacks in the league. Being a quarterback in the NFL is difficult. Often, he's the youngest player on the field, but he's the most important. He usually plays for a bad team, and he's expected to make things better. Every play is a trap, and every throw is a tease. Wins: With 52 starts, Winston has had the most opportunities to get a win, but he's 10 games under .500. Tennessee quarterback Marcus Mariota, taken just behind Winston, has won a fourth-more games with 28. The Rams Jared Goff has played one fewer season, and he didn't win a game as a rookie. But he has 22 wins to Winston's 21. Carson Wentz has also played one fewer season, and he's been hurt this year. But he has passed Winston with 23 wins. Losses: Winston has lost the most games of any quarterback on the list with 31. His winning percentage is 40.4, which is the worst percentage of any quarterback on the list other than rookies -- only the Jets' Sam Darnold and the Cardinals' Josh Rosen are worse. Completion percentage: It's close, but Winston's 61.3 percent is behind eight of the other 12 quarterbacks on the list. Winston leads only the four rookies on the list -- Darnold, Rosen, Josh Allen and Lamar Jackson. Rating: The good thing about a quarterback rating is that it doesn't matter how many games a player has played. The bad thing is that it doesn't take a lot of factors into consideration: Rushing yards, fumbles, drops, etc. For what it's worth, Winston was seventh on the list. He leads only Chicago's Mitch Trubisky and the rookie foursome of Darnold, Rosen, Allen and Jackson, who are still learning. Touchdown percentage: No, it wouldn't be fair simply to consider touchdowns. The more games a guy plays, the more his total. But the percentage of his passes that go for touchdowns is something else. Winston's is 4.5, which is seventh on the list. He leads Mariota, but the other four behind him are the rookies. Fumbles: It's one area where Winston has shown growth. After being tiedfor the league lead in each of the last two seasons with 13, Winston is just 46th this year with one. Still, his average is four a year, which ties him with Wentz for the worst on the list. Mariota, at 3.3, is just behind. Passing yards per game: Winston ranks high in total yardage, but his number of games played can make that deceiving. A better picture is yards per game. Still, Winston is third on the list behind the Chiefs' Patrick Mahomes and the 49ers Nick Mullens. Average net yards per pass: Most quarterbacks are between six and seven yards per throw. Winston. Winston is tied for fifth (with Goff) at 6.73. Mahomes leads the way at 8.04. Rushing yards per game: It's a tricky stat, because it can shorten the life of a quarterback (see: Robert Griffin III). But quarterbacks can drive coaches crazy by running for the occasional first down. Winston is just above the average for the 13 quarterbacks listed, averaging 14 yards a game. That's behind Lamar Jackson, who averagesmore than 40 yards a game, and behind Deshaun Watson and Sam Darnold (both over 30) and Trubisky (27.6). But Winston leads the rest of the pack. For most quarterbacks, the ability to escape pressure is more important than his running totals. 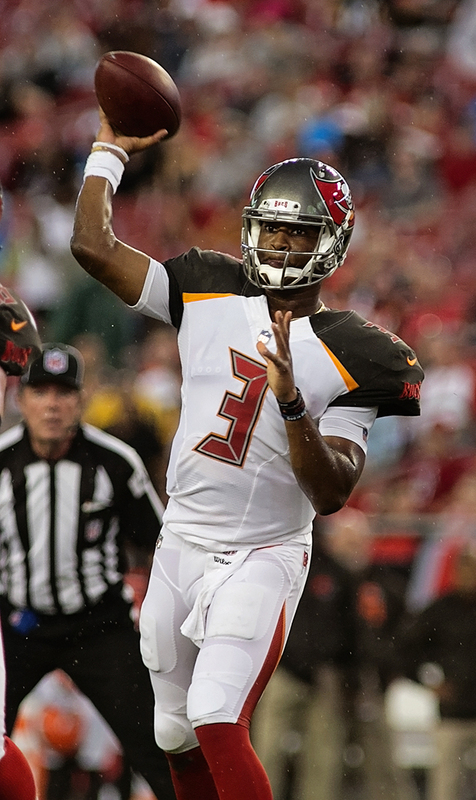 Fourth quarter: Again, Winston has had more opportunities. But he has nine game-winning drives and five fourth-quarter comebacks. That's far behind Mariota, who has 12 game-winning drives and 10 comebacks. Only Goff (five and five), Deshaun Watson (five and five) and Wentz (four and four) are anywhere close. Sacks: Even with a leaky offensive line, a quarterback has to avoid sacks. Sometimes, that means throwing the ball away. Sometimes, it means scrambling for a short gain. Winston has been pretty good, getting sacked six percent of the time. Mahomes (4.7) and Mayfield (5.8) are better, and Wentz and Mullens are tied with Winston for third. Suspensions: None of the other young quarterbacks have been suspended. So where does that leave us? It leaves us disappointed and frustrated. Even those who were critics from the moment he was drafted wanted Winston to succeed. They wanted him to grow. They wanted him to win. What ? No grades for this class of young QB’s? No A,B,C,D,orF! Hey, seriously Gary great job with the stats. Bottom line…will Winston be here next season? What are the odds? I think he’ll be back, and the new coach will have one year to evaluate him (as Schiano did with Freeman). Let’s see. I’d give As to Goff, Mahomes, Watson and Wentz (an A-). I’d give Bs to Trubisky Mariota and Jackson (so far). I’d give Cs to Mayfield and Mullens. Id give a D+ to Winston and Darnold. I’d give Fs to Rosen and Allen. Yeah, about dead on I figure. So if they keep Winston dose that make Fitz trade bait? When is his contract up anyway? Fitzpatrick, sadly, is not trade bait. He signed a one-year contract, which means he’ll be a free agent. He’s talked about retirement, but maybe the limited success of this season will energize him. He’d be a tough guy to trade. Most teams trading for a quarterback, even a backup, want him to at least be in the running to be a starter. I think Fitz is recognized as being a pretty good backup who can fill in for 3-4 games, but time and talent will catch up to him. Most teams simply wait out the free agent market. There is usually some movement among those guys. I wouldn’t be surprised if Fitz stays here. He likes the offense, and he has to figure with Winston, there will be some opportunities to play.